Musashi wrote that it matters not which stance one adopts in combat, whether it be the low guard or the high guard, the left stance or the right stance, adding that the way of strategy is in cutting down the enemy. Form must follow function. The everyday stance must be the combat stance and the combat stance must be the everyday stance. From this we find military adages such as an inspection ready unit is not ready for combat and a combat ready unit will never pass an inspection. This is true, yet seldom examined. Why? The nature of military organizations when not actively engaged in conflict is to become increasingly bureaucratic. The further away from combat, the further detached the organization’s mentality becomes from what is important. This occurs not only geographically, but also in time, such that the lessons of history are distorted or forgotten. Not only is truth the first casualty of war, but also the first casualty of bureaucracy. The military organizations that become larger also have a tendency to be geographically dispersed, to the extent that parts of the organization are also detached from the realities of combat. This has been true since time immemorial. 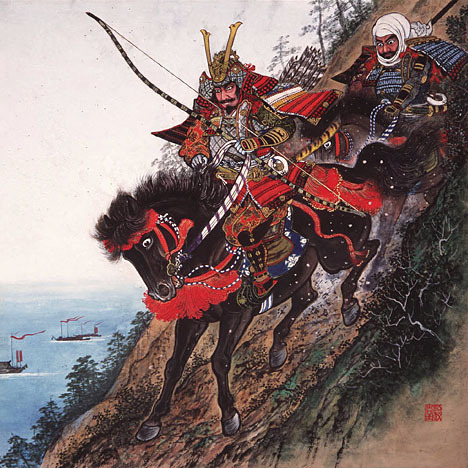 As the Gempei wars in Japan raged between the nation’s two major factions, Minamoto Yoritomo, who would go on to establish the first military rule and take the title Shogun, specialized in administration and court intrigue, while his brother Minamoto Yoshitsune was winning victories in the field. Yoritomo enjoyed the status and position of being the head of his military faction, yet eschewed leading the battles directly, for in his mind the real generalship was in the political realm. Yoshitsune, on the other hand, focused on implementing guile, strategy, and unconvential tactics to route opponents. Yoshitsune & Benkei: Sneak Attack on the Taira in the battle of Ichi no Tani. In so doing, Yoshitsune developed a reputation as a great leader and became hugely popular among the troops and the people. Before long, Yoritomo’s jealousy for his brother’s popularity led to contrived charges of treachery and, once the major battles were finally won, Yoshitsune was declared an outlaw. Despite appealing to his brother and declaring his loyalty while on the run, Yoshitsune was killed in battle against a division of the same army he had been fighting for. In the long run, the politically minded bureaucrat won out over the battle tested tactician. The very nature of bureaucratic organizations is to put form ahead of function, in terms of priority. Adherence to rules, uniformity, and support of the party line are more important than tangible results. To be successful in battle, most frequently, rules must be discarded, regulations ignored, and unpredictable tactics employed. This spontaneity is anathema to the politician or bureaucrat. The politician cannot get ahead of the spin cycle or appear to take credit for such irregularity. The bureaucrat cannot orient on the unconventional. It does not compute within the framework of regulations established to set order within the organization. They have no way to measure success outside of this conformity. Whereas the warrior adheres to principles that lead to victory, the bureaucrat adheres to regulations that maintain the status quo. The two are irreconcilable. This entry was posted in Leadership, Strategy, Tactics and tagged Bakufu, bureaucracy, Gorin no Sho, Kamakura, Minamoto, Musashi, Yoritomo, Yoshitsune. Bookmark the permalink.